Disability can pose many challenges, not least feeling excluded when it comes to finding a job. But now, disabled people struggling to find work are hopefully seeing improvement with the success of a Government scheme. Recent figures have shown that it has so far allowed over 600,000 people to move into work since it began just four years ago. 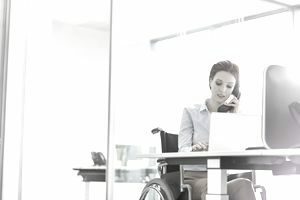 In the past, it has often felt like a losing battle getting employers to recognise the talent and skills of people with mobility or health issues. Now, positive changes have been made since the launch of the Government Disability Confident Scheme and the numbers certainly speak for themselves. More than 2,300 disabled people move into work every week across the UK since the scheme was launched in 2013. Thousands more decide to use their skills to go it alone as entrepreneurs. The future is looking bright for those who want to get into work but have previously felt excluded. “Employing disabled people has benefited the business in lots of different areas. Why wouldn’t you want to pick from a huge talent pool?” he added. I am looking for P/T work. I am a P/T wheelchair user, but still feel I have a lot to offer.